From 1927, Withington Girls’ School was one of two hundred and thirty schools aided by capitation grants from the Government. In return for this, Withington reserved 10 percent of places for pupils from public elementary schools. ‘Administrative action was taken by the Ministry of Education concerning Direct Grant Schools for which new conditions were laid down. Some schools which had been Direct Grant schools, decided to give up financial aid, to award no free-place scholarships and to increase their fees to such an extent that they could continue successfully as Independent schools. Other schools decided to charge no fees and to become increasingly ” aided ” by the Local Education Authorities. 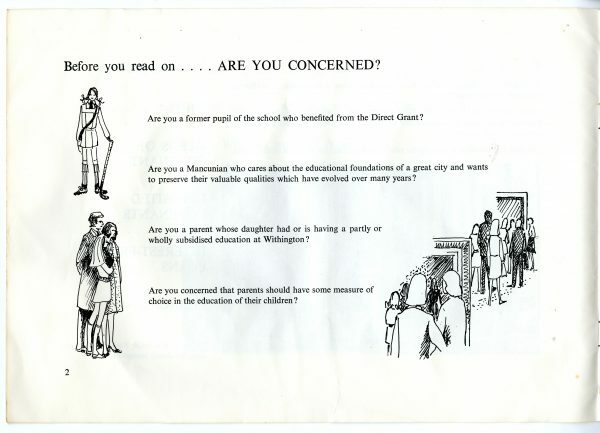 In 1945 Withington Girls’ School was recognised as a Direct Grant Grammar School. Pupils entering the School from a low-income family would have financial assistance provided by the Ministry of Education and the Local Education Authorities. 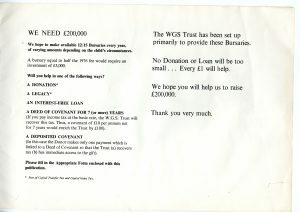 WGS continued to offer opportunities to girls of different backgrounds under the Direct Grant Scheme until it was abolished in 1976. At this time, Miss Hulme was Headmistress and oversaw the transition back to Independent status. Miss Hulme did not want gifted girls from low-income families to miss the opportunity to attend WGS. She quickly established a bursary scheme to ensure that the school remained open to pupils from all backgrounds. 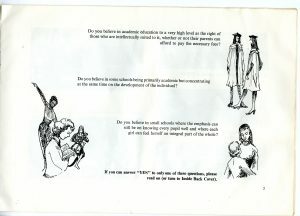 The very first Bursary Appeal leaflet produced in 1976 explained that the School hoped to raise £200,000 to provide assistance to intellectual girls who may not otherwise be able to attend. The booklet asks the reader ‘Do you believe in small schools where the emphasis can still be on knowing every pupil well and where each girl can feel herself and an integral part of the whole?’ The Bursary Fund now enables 1 in 6 girls to benefit from Withington’s facilities. Miss Hulme’s foresight and immediate resolve to establish the Bursary Appeal has meant that many girls have benefitted from this support over the years. To hear a selection of personal stories regarding the Bursary, please watch our Withington Now and Then oral histories film. Here, Old Girls speak of their memories and you will find a whole section dedicated to the Bursary Appeal.